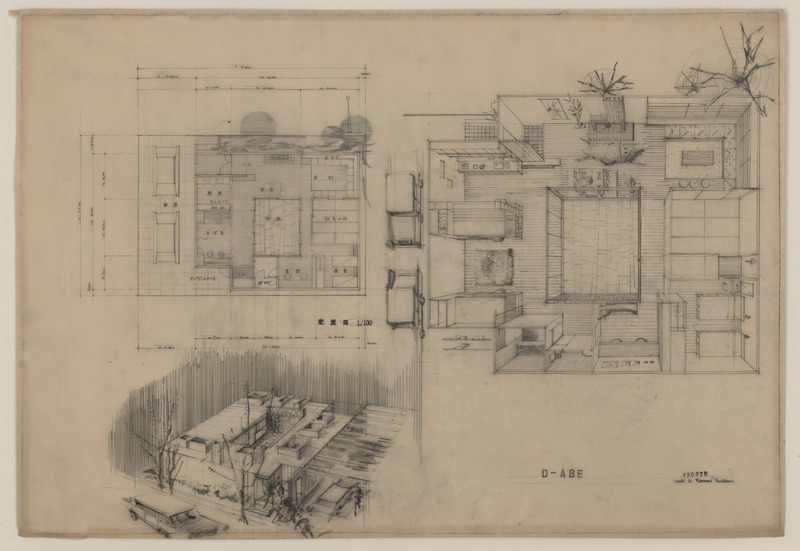 Floor plan, bird's eye view and perspective drawings of the Susume Abe residence completed in 1967 by Kimiko Suzuki. Abe was a famous education critic in Japan. Kimiko Suzuki (1929-1992) attended Japan Women’s University and was their first graduate in the housing studies program. Due to the economic conditions of Japan following World War II she could not find work in an architecture office. She instead joined a publishing company because she was promised the same salary as a man. Following her marriage she found work in an architecture office. She performed her traditional roles in a big family and simultaneously kept working in the architecture office often working until late at night. However, nursing care of her husband’s parents forced her to resign from the architectural firm. She thus began a practice out of her home working on residential projects, a kindergarten, and a medical clinic. She developed cancer at 50 and after a long struggle with the illness withdrew from architectural practice at 60. She passed away three years later at 63. Permission to publish material from the Kimiko Suzuki Architectural Collection must be obtained from Special Collections, Virginia Tech. Researchers wishing to cite this collection should include the following information: Kimiko Suzuki Architectural Collection, Ms2013-089, Special Collections, Virginia Tech, Blacksburg, Va.
Suzuki, Kimiko, “Architectural Drawing, Kimiko Suzuki, Abe House #430328, nd (Ms2013-089),” VT Special Collections Online, accessed April 23, 2019, http://digitalsc.lib.vt.edu/Ms2013-089/Ms2013-089_SuzukiKimiko_ArchitecturalDrawing_nd_430328.